Smeg Australia celebrates this season of love with a special Passione by Smeg Instagram competition. Go to @smegaustralia’s Instagram account, like the Passione love potion post, tag a friend in the post’s comments, and answer the question ‘What are the five ingredients in your love potion?’. This entry could win you a Smeg blender love potion pack and a luxury weekend at Skye Suites in Sydney's CBD. Both you and your friend must follow @smegaustralia and @skyehotelsuites on Instagram. This special promotion, which opened on Monday 11 February 2019, will close at 5pm, Monday 11 March 2019. The prize draw will take place at 4pm on Monday 11 March 2019. Prizes: The winner will receive 2 nights’ accommodation in a Deluxe Studio Suite with flights and breakfast for two plus a Smeg blender love potion pack, valued at up to $3500. 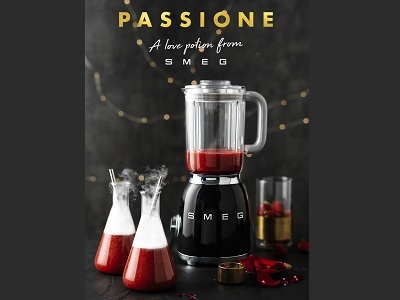 There are also Smeg blender love potion packs for ten lucky runners-up.